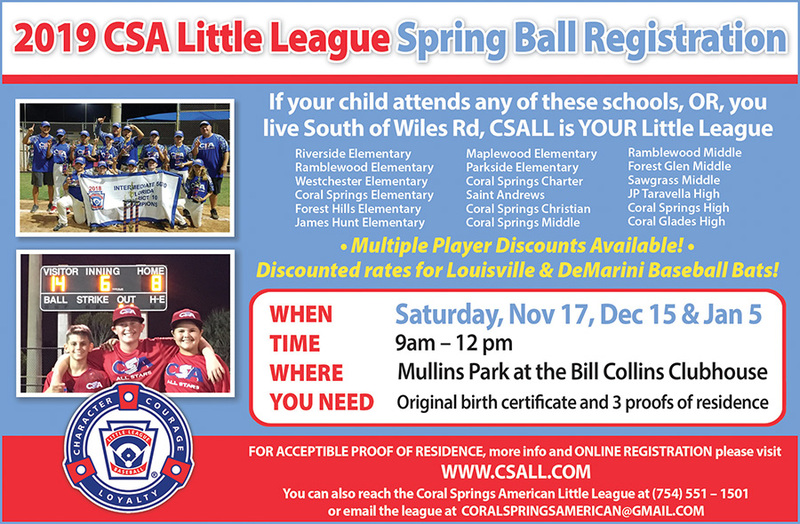 Welcome to Coral Springs American Little League web site. If your child lives South of Wiles road in Coral Springs or attends any of the following schools, you should register with CSALL: Elementary Schools: Riverside, Ramblewood, Westchester, Coral Springs, Forest Hills, James Hunt, Maplewood, & Parkside. Middle Schools: Coral Springs, Ramblewood, Forest Glen, & Sawgrass. High Schools: Taravella, Coral Springs, & Coral Glades. Also: Coral Springs Charter, Coral Springs Christian, & St. Andrews School. All Registration information is HERE. If you encounter difficulties with on-line registration, please contact us at [email protected].